Description Pravastatin is a cholesterol-lowering agent that belongs to a class of medications known as statins. It was derived from microbial transformation of mevastatin, the first statin discovered. 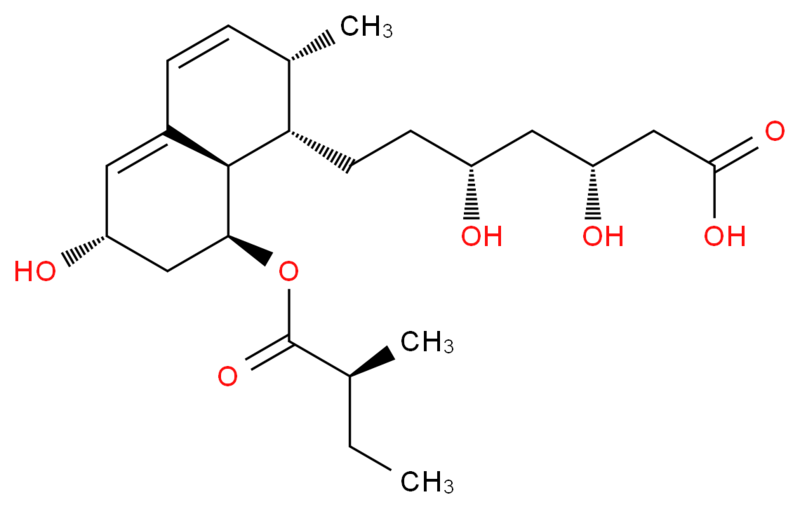 It is a ring-opened dihydroxyacid with a 6’-hydroxyl group that does not require in vivo activation. Pravastatin is one of the lower potency statins; however, its increased hydrophilicity is thought to confer advantages such as minimal penetration through lipophilic membranes of peripheral cells, increased selectivity for hepatic tissues, and a reduction in side effects compared with lovastatin and simvastatin. Indication For the treatment of hypercholesterolemia and to reduce the risk of cardiovascular disease. Pharmacology The primary cause of cardiovascular (CV) disease is atherosclerotic plaque formation and sustained elevation of cholesterol in the blood increases the risk of CV disease. Pravastatin lowers hepatic production of cholesterol by competitively inhibiting HMG-CoA reductase, the enzyme that catalyzes the rate-limiting step in the cholesterol biosynthesis pathway via the mevalonic acid pathway. Decreased hepatic cholesterol levels causes increased uptake of low density lipoprotein (LDL) cholesterol and reduces cholesterol levels in the circulation. Pravastatin also inhibits hepatic synthesis if VLDL. At therapeutic doses, pravastatin lowers LDL cholesterol by 20-30%, increase high density lipoprotein (HDL) cholesterol by 3-10%, and decrease plasma triglycerides by 19-34%. HDL cholesterol is thought to confer protective effects against CV disease, whereas high LDL and triglyceride levels are associated with higher risk of disease. Biotransformation Hepatic, there is a small amount of metabolism by P450 enzymes, but this effect is so minimal that inhibitory pharmacokinetic drug interactions have no real effect on its overall activity and elimination. An in vitro study which found moderate affinity for P450 2C9 (major), 2D6 and 3A4. Absorption Average oral absorption of pravastatin is 34% and absolute bioavailability is 17%. Elimination Approximately 20% of a radiolabeled oral dose is excreted in urine and 70% in the feces. Radiolabelled Pravastatin (P702000). A competitive inhibitor of HMG-CoA reductase. Bioactive metabolite of Mevastatin.